Any workflow is known to be consisting of some repeatable as well as an orchestrated pattern. This pattern is the one of a business activity that is enabled by the systematic organization of resources into some definite processes. The las-mentioned processes can transform the materials, provide different services or some particular process information. Any workflow can be depicted as a sequence of different operations. Such operations may be declared as work of a group or a person, an organization of staff, or some more, either complex or simple, mechanisms. Any workflow may be also considered as a view or some representation of a real work. The flow that is described in a way of an illustration, may refer to some particular document, product or service. Any of such documents, products or services may be transferred from one step to another. Sometimes the workflows may be viewed as one fundamental building block. Such block may be combined with other parts of organization's structure. To represent the workflows, the flowcharts can be created which are known to be a type of diagram that represents some particular algorithm, process or workflow. By showing the steps in a way of the boxes of different kinds which are all connected by the arrows, this diagrammatic representation may be used as a convenient tool for illustrating some particular solution models to the given problems. Being used in designing, analyzing, managing the processes, the programs or/and documenting in different fields of business activity, flowcharts can be created in the ConceptDraw DIAGRAM diagramming and drawing software within only a few minutes. The Workflow Diagrams solution was developed for a purpose of extending the ConceptDraw DIAGRAM software with the pre-made examples and templates of the workflow diagrams as well as a library full of vector stencils for making the needed drawings at an ease. Representing the documents, transferring of data and the tasks during the performance of the work process has become much simpler for many specialists such as university professors, PhDs, postgraduates, postdocs, scientists, researchers, IT specialists, computer engineers, network and telecommunication engineers, software engineers, technical writers, system administrators, technical support specialists, IT managers, system architects and many other professions. There are 10 stencil libraries containing 317 vector graphics for Business Process Workflow Diagrams solution. There are a few samples that you see on this page which were created in the ConceptDraw DIAGRAM application by using the Business Process Workflow Diagrams solution. Some of the solution's capabilities as well as the professional results which you can achieve are all demonstrated here on this page. All source documents are vector graphic documents which are always available for modifying, reviewing and/or converting to many different formats, such as MS PowerPoint, PDF file, MS Visio, and many other graphic ones from the ConceptDraw Solution Park or ConceptDraw STORE. The Business Process Workflow Diagrams solution is available to all ConceptDraw DIAGRAM users to get installed and used while working in the ConceptDraw DIAGRAM diagramming and drawing software. This diagram was created in ConceptDraw DIAGRAM with the help of the libraries from the Business Process Workflow Diagrams Solution. An experienced user spent 15 minutes creating this sample. This Business Process Flow Diagram in detail illustrates all steps of the grant accounting business process flow from the moment of recording a Grant Award to the moment of completion of the business process flow. Designed in ConceptDraw DIAGRAM application, this example has as the base the workflow diagram published on a website of the North Carolina Office of the State Controller. The grants are non-repayable funds or products, that are mostly allocated to individuals for a specific goal, to fund a specific project, are disbursed by a grant maker that is often a government organization, and are strictly accountable. Pay special attention to the use of colorful clipart and color division applied on this diagram. The workflow steps corresponding to the federal budget code are marked with a green color on the diagram, for the operating budget code is used the red color. The matching of colors is explained in a legend. This diagram was created in ConceptDraw DIAGRAM with the help of the libraries from the Business Process Workflow Diagrams Solution. An experienced user spent 10 minutes creating this sample. This Business Process Workflow diagram in detail shows how Wikivoyage users get a global username for migration to WMF. This diagram was designed by means of the ConceptDraw DIAGRAM software and tools of the Business Process Workflow Diagrams solution, based on the Wikimedia Commons file "Wikivoyage Global ID Workflow.svg". The Wikivoyage or "Wikipedia of travel guides" is a free outdoor multilingual web-based project dedicated to tourism, different travel topics and destinations, and to the creation of free travel guides. Created by the volunteer authors, the Wikivoyage is supported by the Wikimedia and hosted on its servers. As for the global account, it is a unified login reserved for a single username and used for almost all Wikimedia projects, excepting some special Wiki services. This feature gives a freedom and identity for the Wikimedia users allowing them to visit and to use different kinds of Wiki projects without logging in on each of them. Association for Standardization of Automation and Measuring Systems (ASAM) is an incorporated association of more than 140 international car manufacturer companies and suppliers from the area of the automotive industry. ASAM is registered under a German law and is occupied by the synchronization of development the technical standards, which define the protocols, file formats, data models, and APIs (application programming interfaces) that are used in a process of development, manufacturing and testing the automotive electronic control units. This Business Process sample depicts the life cycle of an ASAM standard using the format of a Workflow diagram and was constructed on the base of the Wikimedia Commons file "ASAM e.V. flowchart.png". The use of swim lanes on this diagram is reasonable by the fact that a given process is quite complex and is realized with a participation of many people, so the use of swim lanes is definitely needed in this case. This diagram was created in ConceptDraw DIAGRAM with the help of the libraries from the Business Process Workflow Diagrams Solution. An experienced user spent 5 minutes creating this sample. The development and productivity enhancement are very important components in a life of any organization, the components that provide the company's success. So, it is an issue that causes the increased attention of various specialists. This Business Process Workflow Diagram visually demonstrates the process of the organization's development and business process reengineering. Designed with the use of ConceptDraw’s objects, it is based on the same named chart published on the website of Bremen University. All the diagrams created in ConceptDraw DIAGRAM application have a broad application in all areas of business and can be effectively used for business process optimization and solution different business tasks. Two key objects on this diagram are Old System and New System, another objects represent the workflow steps from the old system to a new one. At this all them, just like the arrows, are taken ready-made from the libraries of ConceptDraw's Business Process Workflow Diagrams solution. This diagram was created in ConceptDraw DIAGRAM with the help of the libraries from the Business Process Workflow Diagrams Solution. An experienced user spent 20 minutes creating this sample. This diagram illustrates the power of capabilities of the Business Process Workflow Diagrams Solution from the Business Processes area of ConceptDraw Solution Park. The noted solution offers the tools needed to design as simple as complex Business Process Workflow Diagrams. This example is a Business Process Workflow Diagram based on the Wikimedia Commons file "Read to edit workflow.pdf'. The sample gives a comprehension of the possible bottlenecks in the reader to new editor conversions and has the aim to evaluate quantitatively the drop-off rate at different points in a workflow of readers that try to edit the Wikipedia articles without registration. Just one look at this diagram leads to the understanding that it is a really complex diagram with a lot of steps, actions and variants of development events, however having installed the ConceptDraw DIAGRAM software and Business Process Workflow Diagrams Solution, you can easily cope with the task of representing workflow of any complexity. This sample represents the Workflow diagram designed on the base of the Wikimedia Commons file "Article creation workflows (enwiki).svg". You can see that the process workflows of creation the articles to be posted on English Wikipedia are placed in two columns (Draft space and Main space), and are represented in a form of a directed graph. Moreover, their difference is highlighted by the use of diverse colors in columns design. With active development the information technologies and general technical progress, the electronic encyclopedia Wikipedia gains more and more popularity each day, so its filling with articles becomes even more relevant and this Workflow Chart has great practical value. The clipart used on this diagram adds to it the more visuality and attractiveness. Use the ConceptDraw DIAGRAM to design your own Workflow Diagrams, to represent the workflows of different business processes, when making the reports, instructions and other documents on a requirement. This example shows the Process Workflow Diagram representing the business processes and IT systems. The diagram is based on the "Business Processes, IT Systems and V-Model" illustration from the website of Bremen University. To the information technologies and business processes in information systems is given a lot of attention at the moment. V-Model that is noted on this diagram, is a term applied to a wide range of models and allowing one to provide the guidance for planning and realization projects, to simplify the understanding of all difficulties and complex aspects associated with development of the information systems. It is a model of the information system’s development, which aims to the simplification of these systems planning, development and implementation, also to the minimization risks and project’s total cost, and at the same time improving quality and facilitating the communication between project participants. Constructed in bright colors, this diagram perfectly suits for using in presentations, publications and documents. This workflow diagram example is dedicated to the business processes structure and analysis. Having as the base the diagram published on the Bremen University website, in a section of Computer Science, Faculty 3, it demonstrates the connection of the business process reengineering with V-model. 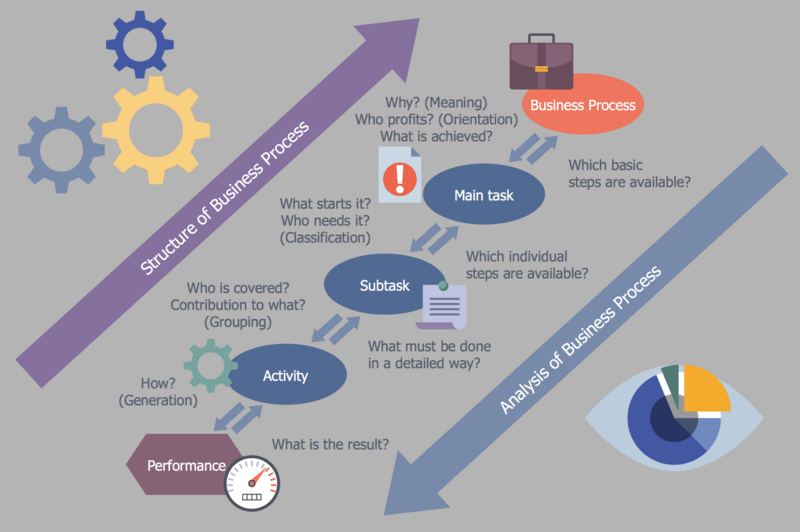 The direction of the business process structure is depicted by the arrow, having the ascending direction from the left down corner to the right top corner of the diagram, while the direction of the business process analysis is also represented by the arrow and has an inverse direction. The steps of a workflow are depicted using the oval vector objects and are named correspondingly as Performance, Activity, Subtask, Main task, and Business Process. All objects you see on this diagram, including clipart objects, are taken from the libraries of ConceptDraw's Business Process Workflow Diagrams solution and ideally suit for designing strict and clear business diagrams of any degree of complexity. This Business Process Workflow Diagram example demonstrates the Government Records Cataloging Flow and was designed on the base of the diagram placed on the website of the Taiwan National Archives Administration. The records can be the tangible objects or a digital information, which is created or received by an organization in pursuance. The Records management (abbr. RM) or the records and information management is a commonly intended professional practice directed on the managing the records of an organization during all their life cycle, literally from the first moments of their creation to the moment of final remove. The RM process involves the identification and classification of records, their storing and securing, tracking, retrieving, and also destroying. The steps are sequentially depicted and enumerated on this diagram, contain the information in a short form inside the boxes and also some extended comments near them, have clipart and arrows showing the workflow's direction. This example representing a Business Process Workflow Diagram was created in the ConceptDraw DIAGRAM application basing on the "Diagram of New Application Workflow" illustration offered on the website of United States Patent and Trademark Office (USPTO). The filing a patent application involves a large number of steps that must be performed clearly and in a certain sequence. It's not the easiest process that includes the writing of a specification document, making drawings, writing a declaration, payment fees and filing receipt, but having at hand the clear instructions, any person is able to do everything correctly. And if this instruction is executed in a visual form of a diagram or workflow chart, it will further facilitate the understanding of a given process and will not cause difficulties with its implementation. Facilitate the process of demonstration the workflow steps in a visual and clear form, using the ConceptDraw DIAGRAM software extended with the Business Process Workflow Diagrams Solution. After ConceptDraw DIAGRAM is installed, the Business Process Workflow Diagrams solution can be purchased either from the Business Processes area of ConceptDraw STORE itself or from our online store. Thus, you will be able to use the Business Process Workflow Diagrams solution straight after. First of all, make sure that both ConceptDraw STORE and ConceptDraw DIAGRAM applications are downloaded and installed on your computer. Next, install the Business Process Workflow Diagrams solution from the ConceptDraw STORE to use it in the ConceptDraw DIAGRAM application. Start using the Business Process Workflow Diagrams solution to make the professionally looking business processes diagrams by adding the design elements taken from the stencil libraries and editing the pre-made examples that can be found there.